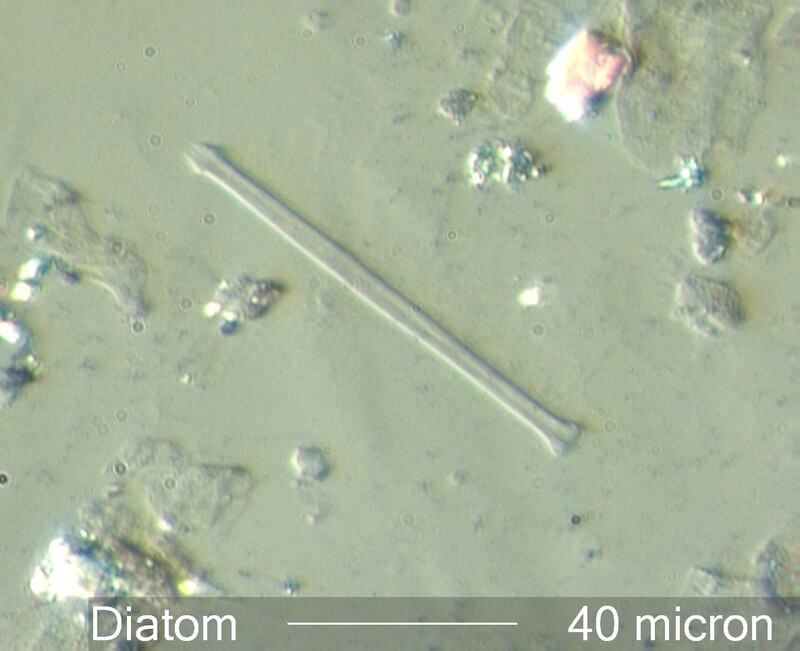 This diatom is common in some lake and reservoir sources for tapwater. When in tact, this is one branch of a star pattern. The tapered end (upper left) is the end that was attached to its neighboring branches. This specimen was found in a tapelift from a kitchen counter. "white" spots on counters around sinks may be diatoms or calcium containing salt deposits. Diatoms are algae that have a shell, called a frustule, that are composed of non-crystalline silica. As with other algae, they may grow in bodies of water or in moist soil. They are characterized by shape and sculpturing elements. Diatoms are often good indicators of the nature of the environment from which they came. There are specific diatoms that are marine, estuarine, or fresh water types. They may indicate pollution, mineral content, temperature, and other environmental features. They are often found in airborne or surface samples as a result of wave action, dredging, or evaporation of pools in which they grew to then become airborne as a result of surface air turbulence. There presence in these samples indicate the nature of nearby bodies of water. Asterionella often indicates a high calcium content in the fresh water in which they grew. Asterionella is one of the worst odor causing algae. In low concentration it imparts a geranium-like odor but in higher concentrations produces a strong fishy odor. Diatoms are non-crystalline silica and so are isotropic with a refractive index of about 1.48. The genus, Asterionella, is characterized by its habit of growing in planar, circular, radiating colonies. These colonies often disassociate after the death of the organisms, as in this case. U.S. EPA, ALGAE AND WATER POLLUTION, EPA-600/9-77-036, p. 53, Plate II, 1977.